Taking care of your baby and making sure that you feed it everything it needs starts way before the birth. In fact, it starts before the baby is even conceived. The best prenatal vitamins contain all of the important nutrients that are so critical to a healthy baby and pregnancy in a gentle form that is easy on the stomach. 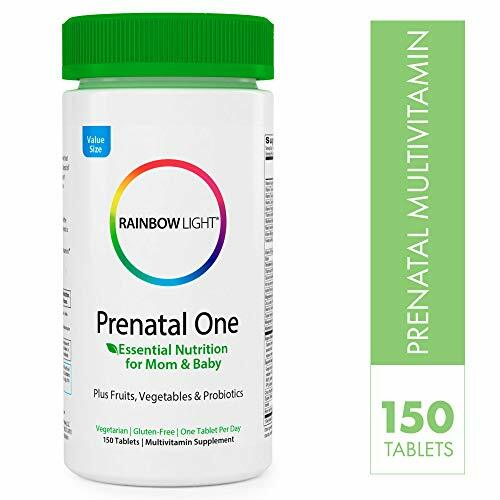 Our pick, Rainbow Light Prenatal One Multivitamin, is the perfect choice for all your prenatal vitamin needs. Prenatal vitamins are supplements that are designed to provide the mother-to-be with the nutrients she needs to sustain a healthy pregnancy and give the baby everything he or she needs without sacrificing her own health. There are tons of prenatal vitamins on the market to choose from. SO many, in fact, that deciding on one kind can feel really overwhelming. The purpose of this buyer’s guide is to help you understand what makes a great quality prenatal vitamin and how to choose the right one for your needs. The purpose of a prenatal vitamin is not to replace healthy eating, it is meant to complement it. You still want to be sure that you are purchasing the absolute best quality prenatal you can find so you can be confident that it contains all the elements you need it to. Rainbow Light Prenatal vitamins start with a base of superfood extracts that contain all of the vitamins and minerals you and your growing baby need. Just one tablet per day gives you botanicals, vitamins, minerals and more to support your nutrition while also supporting spinal and brain development in your baby while it is growing. Just some of the vitamins this supplement has in it are folic acid, vitamins C, A and D2, and iron as well. Rainbow Light offers women the highest quality, purest prenatal vitamin they can get that is free of soy, dairy, yeast, shellfish, gluten and nuts. It also contains no artificial ingredients of any kind including artificial colors, flavors preservatives or other additives. The plant-source enzymes and millions of probiotics help to improve digestion without any stomach irritation or upset. The vegan formula is perfect for vegetarians and vegans to safely take as well. If you’re looking for a high quality prenatal vitamin to help supplement your diet, Rainbow Light is the one to choose. It has everything you need to help your baby be as healthy as possible while you are pregnant while helping you stay healthy too. Garden of Life is another well known and respected name in supplements. This specially formulated prenatal vitamin contains RAW whole foods and is approved for vegetarian usage as well. Mothers will have plenty of digestive support with the probiotics, vitamin D, zinc and ginger that aide in easier digestion during a time when stomach upset is commonplace. There are no fillers, binders, gluten or dairy in this prenatal vitamin that can be taken before conception, during pregnancy and during breastfeeding as well. It provides mom and baby with everything they need to supplement a healthy diet. Since the baby gets its nutrition from the mother-to-be, it’s important to make sure that mom has all of the nutrients she and the baby need. 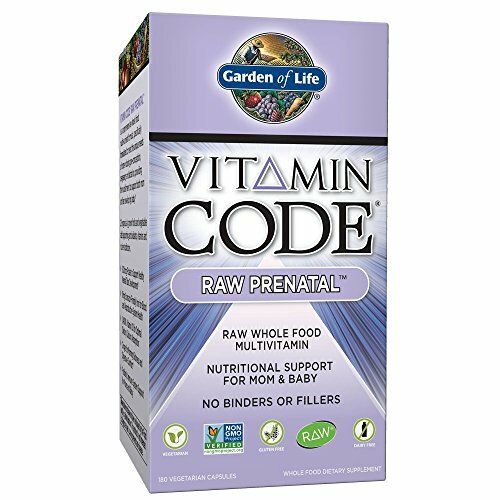 Garden of Life prenatal vitamin achieves this with this high quality prenatal supplement. New Chapter is a well known supplement company that prides itself on high quality supplements for consumers. Their prenatal vitamin is an excellent example of this high quality focus. It is 100% digestible and very gentle even on an empty stomach. It has been formulated with a unique blend of fermented probiotics and whole foods that will not cause ANY nausea. The ingredients include superfood sprouts like cauliflower, kale and broccoli that are all organic. They are the first prenatal vitamin that has been made with vegetables and herbs that are certified organic. It is completely pure, Non-GMO project verified, Kosher, sugar and gluten free and contains no synthetic fillers. It is perfect for vegetarians. This premium prenatal vitamin provides moms-to-be with everything they need for a healthy baby and pregnancy. Whether it’s Folate or Vitamin D3, you will have every vitamin and mineral you and your baby need for the best outcome possible. It’s not called the Perfect Prenatal for nothing! There are many different kinds of prenatal vitamins on the market. Knowing which one to choose is just a matter of knowing what to look for in the supplement you are considering. Each person’s individual needs could be different so it is important to get your doctor’s recommendation on what your specific needs are. The three prenatal choices we have reviewed above are great examples of high quality prenatal vitamins that contain all the nutrients and vitamins you need while also getting whole food nutrition and the purest form of prenatal vitamins you can find. If you want to learn more about what makes a great prenatal vitamin, read the buyer’s guide below. It has information on how to choose the right supplement and what a great quality prenatal vitamin contains for the health of you and your growing baby. This information will make the decision making process much simpler and give you confidence that the purchase you make will be the best for your nutritional supplement needs. There is a difference between prenatal vitamins and regular multivitamins. If you plan on conceiving a baby or you are already pregnant, taking a good quality prenatal vitamin is very important. Prenatals have the types of vitamins and minerals that pregnant women and the unborn babies need in the dosages that they need. One notable example of this is folic acid. Prenatal vitamins have higher amounts of folic acid which is a very critical nutrient in preventing neural tube defects. They also have more iron than the usual multi-vitamin. Iron is crucial for the healthy growth and development of the baby in utero. It also prevents anemia in the mother. There are also some studies that suggest that prenatal vitamins can decrease the risk of the baby being born smaller than they should be for their gestational age. There are many benefits to taking a quality prenatal vitamin. These benefits can start before you conceive the baby and last throughout the pregnancy and provide benefits during breastfeeding as well. For this reason, the quality of the prenatal vitamin is very important. We have listed several of the benefits below. Reduces nausea – The vitamin B6 that is in prenatal vitamins helps to reduce the amount of nausea that you may experience. Research has shown that women who take a prenatal before conception and continue on during the pregnancy have fewer bouts of vomiting and nausea, also known as morning sickness, that commonly occur during the first three months of the pregnancy. Boosts Fertility – Studies have been done that suggest that taking a prenatal vitamin before you are pregnant can increase the chances of getting pregnant faster and can help to increase fertility. Reduces Birth Defect Risks – One of the most important reasons to take a prenatal vitamin is for the increased folic acid they contain. Folic acid is a critical nutrient that reduces the risk of neural tube defects, especially when the woman starts taking it before she conceives. Helps the Mother Stay Healthy – When a woman is pregnant, the growing baby takes what it needs from her system. If she is not taking in additional nutritional support, this can leave her deficient in different vitamins and minerals which can be unhealthy for her and ultimately the baby as well. Taking a high quality prenatal vitamin can prevent those deficiencies from happening. They aren’t meant to replace healthy eating but they are designed to supplement what the woman isn’t getting through food intake. There are several things that you will want to verify and look at when you are considering different prenatal vitamins. We have listed these considerations below so you can easily navigate through the different choices and see which ones meet your needs and the criteria that we have provided. This criterion ensures a high quality prenatal that will give you the extra nutritional support that is so important during your pregnancy. Folic Acid – 600 mcg is the recommended amount that trying-to-conceive, pregnant and nursing mothers should take in. The baby’s neural tube forms in the very first month of pregnancy which is why it is recommended that the woman start taking it before she conceives. Another name for folic acid is vitamin B9. If there is a family history of neural tube defects in the family, the dosage can be as much as ten times that amount or 4 grams of folic acid but your doctor will advise you on the additional amount when they suggest it. Calcium – 150 mg is the amount that you want your prenatal to have. This is another very important nutrient for pregnant women and women in general. It is especially important during pregnancy since you are growing your baby’s bones too. If the doctor feels you need more calcium than the prenantal provides, he will prescribe a separate supplement. Iron – 27 mg of iron is the number to look for in your prenatal ingredient list. Iron is the foundation in which the baby’s cells are formed. Many women become anemic during pregnancy so don’t be surprised if your doctor recommends taking a bit more. Iron can cause constipation so be sure to eat a lot of fiber rich foods to combat this, especially if you have to take more than the 27 mg.
Iodine – 150 mcg of iodine is important for the development of your baby’s brain development and thyroid development. Doctors from the American Academy of Pediatrics recommends that women cook with iodized salt and ensure their prenatals have iodine in them up to 220 mcg per day. If your prenatal supplement doesn’t have iodine in it, or enough, ask about having a separate iodine supplement. Vitamin B6 – 1.9 mg. This important vitamin can play a big part in reducing the severity and frequency of morning sickness. Most prescription morning sickness meds contain B6 due to the fact that it is so effective. Omega 3 Fatty Acids – This is something that your prenantal vitamin more than likely won’t have. Talk to your doctor about taking an additional supplement of omega 3s. This nutrient has been shown to help the healthy development of the baby’s brain before and after birth. If you are not able to ensure that you eat 2-3 servings of fatty fish that are pregnancy safe, you will want to ask about an Omega 3 supplement. Vitamin A – Keep vitamin A to no more than 10,000 IU per day. Anything more than that can be toxic. The best source of vitamin A is beta-carotene. Vitamin D – Everyone needs vitamin D but this nutrient is Important for pregnant women as well. This helps the baby’s bones grow strong and keeps yours strong as well. Women are commonly low in vitamin D so your doctor may decide to check your levels at the first visit and see if you are deficient. You might be told to take in 1,000 to 2,000 IU per day to make up for the deficiency. Zinc – 11 mg of zinc is what you want to look for in your prenatal vitamins. This mineral supports healthy cell division and keeps your immune system strong. Copper – 0.9 mg. This trace element is very important in forming blood cells and maintaining healthy nerves, bones and immune systems. Vitamin C – 85 mg of vitamin C is the amount you want to look for. Vitamin C helps support the mother-to-be’s immune system and also helps the body absorb iron better. Any more than 2,000 mg of vitamin C can be dangerous for the baby so don’t take in more vitamin C than what is in your prenatal vitamin. Others – Vitamins such as E, thiamin, riboflavin, niacin, vitamin B 12 are also in prenatals and typically have 2 to 3 times the DRI (dietary reference intake) There are not any reported concerns from these increased amounts. Depending on the brand, the prenatal vitamin may also contain fluoride, extra B6, panthothenic acid, biotin, magnesium and ginger. Finding the right prenatal vitamin is very important for the health of your baby and also for your health. With so many different formulas and types on the market it helps to know what is important to look for and what is important to avoid. Don’t look for cheap prenatals; you get what you pay for and the supplements simply won’t be as good as the higher quality, and higher cost prenatal vitamins are. This doesn’t mean that you have to purchase the most expensive prenatal vitamins on the market but it does mean that you can expect the cost of the higher quality supplements to be more than the cheaper generic ones. 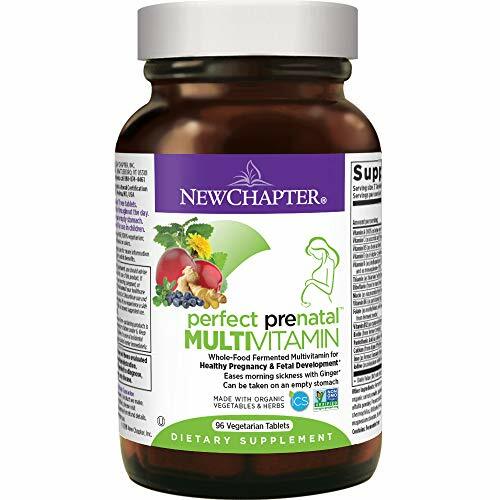 The three prenatal vitamin supplements we have featured above are top of the line supplements made from reputable, well known companies known for producing high quality supplements. If you want to look around some more before choosing, the information contained in the buyer’s guide should have provided you with all you need to sort through the different offerings to determine which meet your needs the best.